USGS Aerial Photo of Medicine Lodge, Barber County, Kansas, 21 March 1996. Medicine Lodge . An incorporated city, the county seat of Barbour county, is located at the confluence of the Medicine Lodge river and Elm creek, in the eastern central part of the county, 30 miles due west of Harper, on the KCL&SK RR, its nearest railroad point, from whence it has a daily mail stage and 75 southwest of Hutchinson, on the AT&SF RR. Originally settled in 1872, it now contains a population of 700, has Methodist and Christian churches, district schools and 2 weekly newspapers, the Cressett and the Index. Live stock is the chief shipment. Tri-weekly mail stage to Hutchinson; far $4.00. W.D. Van Slyke, postmaster. Post Office Book Store in Medicine Lodge, Kansas, 1880's -1890's. 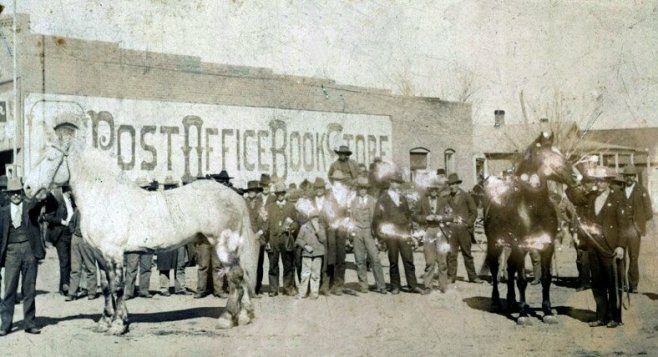 "Post Office Book Store in Medicine Lodge, Kansas, 1880's -1890's. 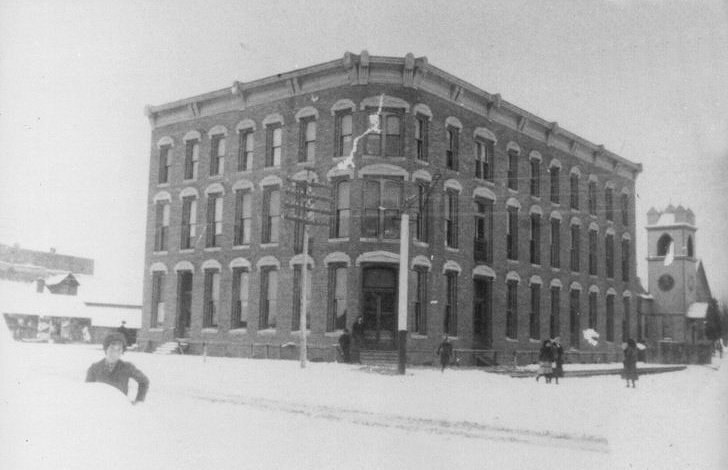 Located across the street from my office where the Home State Bank building is today. Home State was not built until 1920 so this was the prior building. Richardson's Dry Goods used to be in this same building. Looking east on Kansas Ave. with Dr. Kocile's house behind the building." -- John Nixon, 9 May 2008. Medicine Lodge . A progressive incorporated city of the third class, the county seat of Barber county, formerly called Barbour county, is located at the confluence of the Medicine River and Elm creek, in the eastern central part of the county, originally settled in 1872. It is the terminus of the M.L. br. of the SK Ry, 336 miles from Kansas City. Attica is 23 miles east. Has daily stages to and from Kingman, 45 miles northeast, Bross, 23 miles northeast, Pratt Centre, 28 miles northwest, Sawyer, 18 miles northwest, Isabel, 14 miles north, Saratoga, 36 miles northwest, Iuka, 44 miles northwest, Elm Mills, 15 miles north, Mingonia, 9 miles west, Lake City, 18 miles west, Sun City 25 miles west, Nescutunga, 45 miles west, Coldwater 54 miles west, Ashland, 80 miles west, Lodi, 15 miles southwest, Canema, 16 miles southwest, Aetna, 35 miles southwest, New Kiowa, 21 miles south, Old Kiowa, 18 miles south. It has Methodist, Presbyterian and Christian churches, large public school building, 2 banks, 3 weekly newspapers, the Index (Dem) the Cresset (Rep) and the Chief (Labor), and is a distributing point for a territory 25 by 50 miles. There are Masonic, Odd Fellows, K of P and Ancient Order of United Workmen lodges, Order of the Eastern Star and GAR Post. There are also 3 hotels, of which the Grand hotel is one of the finest and largest in Southern Kansas. Assessed valuation of personal property in the city, $110,397; real estate $228,145. No bonded or floating debt. Shipments, horses, live stock, wool and gypsum. Exp., W.,F. & Co. Tel., S.K. Population 1,500. Mail, daily. Thomas A. McClearey, postmaster. Phone: (620) 886-3961. Fax: (620) 886-5425. Lincoln Library, 201 N. Main, Medicine Lodge, KS 67104. Phone: (620) 886-5746. Fax: (620) 886-9985. Carrie Nation House, Highway 160, Medicine Lodge, KS 67104. The Stockade Museum, Highway 160, Medicine Lodge, KS 67104. Medicine Lodge Chamber of Commerce, 108 W. First Street, Medicine Lodge, KS 67104. Barber County Index, 106 W. First, P. O. Box 349, Medicine Lodge, KS 67104. A Christmas in the Wilderness, 1871 by Scott Cummins. A story about some buffalo hunters' Christmas dinner near where Medicine Lodge, Kansas, was later established. Photographs from Medicine Lodge, Barber County, Kansas, October 2006, courtesy of Nathan Lee. Photographs of the Medicine Lodge Peace Treaty Pageant Grounds, courtesy of Nathan Lee. The Grand Hotel, Medicine Lodge, Barber County, Kansas, historic and modern photos courtesy of Nathan Lee, Beverly Horney McCollom and Marilou West Ficklin. Meandering, the weekly column by Bev McCollom, from The Gyp Hill Premiere, Medicine Lodge, Kansas. by David Fasgold, The Gyp Hills Premiere, 27 Feb 2006. The Medicine Lodge Cresset, July 17, 1879. The Medicine Lodge Cresset, September 19, 1879. The Medicine Lodge Cresset, August 31, 1882. The Great Flood of April 21, 1885, Barber County, Kansas. A collection of news articles and a poem about the flood in which 18 people are known to have died. The flood swept through Medicine Lodge. The Medicine Lodge Cresset, April 23, 1885. The Medicine Lodge Cresset, April 30, 1885. The Medicine Lodge Cresset, March 9, 1900. Immense Chase Hardware Establishment a Mass of Ruins. Barber County Index, November 4, 1903. Barber County Index, May 20, 1937. Medicine Lodge Freshmen Basketball Team, 1924, photo courtesy of Bob Osborn. Medicine Lodge High School in the 1930s, photo courtesy of Bob Osborn. The Barber County State Fishing Lake at the north edge of Medicine Lodge, photos by Nathan Lee. Barber County Index, September 29, 1927. "The Medicine Lodge Peace Council": A Graphic Description of Famous Peace Council By An Eye Witness, Gov. A. A. Taylor of Tenn.
Barber County Index, October 20, 1927. This link is to search results at books.google.com for "full view" books which mention Medicine Lodge, Kansas. The complete text of these books, which are in the public domain, is available online and may be downloaded in pdf format for printing. There are 256 books available on 12 February 2006. The 1949 Medicine Lodge city directory, call# K/910/-M46/1949, is available through interlibrary loan from The Kansas State Historical Society. The Grand Hotel, Medicine Lodge, Barber County, Kansas. Photo courtesy Beverly (Horney) McCollom and Marilou West Ficklin. MURDER AND SUICIDE: Frank E. Lockwood is Shot by Lillian Quinn, Who at Once Commits Suicide, The Medicine Lodge Cresset, November 18, 1886. Frank Lockwood was one of the owners of the Grand Hotel. Meandering column by Bev McCollom, from The Gyp Hill Premiere, 29 Oct 2007. Dr. John G. Hoffer, Jr. - During his more than 35 years of practice at Medicine Lodge Memorial Hospital, Dr. Hoffer never lost a patient in surgery. Dr. Hoffer was honored in 1976 for his many years of outstanding service to Medicine Lodge at an awards ceremony in which he was overwhelmed by the turnout and outpouring of appreciation and affection from the community. The following RootsWeb Visitors Counter began counting on 12 June 2008. This RootsWeb website is being created by Jerry Ferrin with the able assistance of many Contributors. Your comments, suggestions and contributions of historical information and photographs to this site are welcome. Please sign the Guest Book. This page was last updated 12 June 2008.